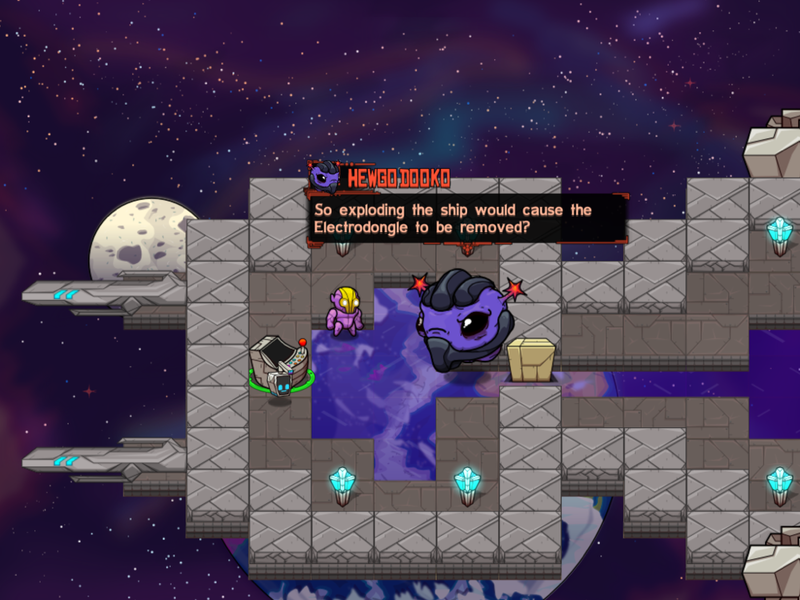 Crashlands Review: How Far Would Hewgo For an Electrodongle? As I get older, I’m less inclined to let myself get pulled into long, time-consuming games. I prefer shorter, unique experiences. But somehow I ended up playing Butterscotch Shenanigans’ Crashlands through to the end, spending over sixty hours on the planet Woanope. That number is due to a mix of addictive qualities of the game, as well as some not-so-great time-wasting aspects of it. 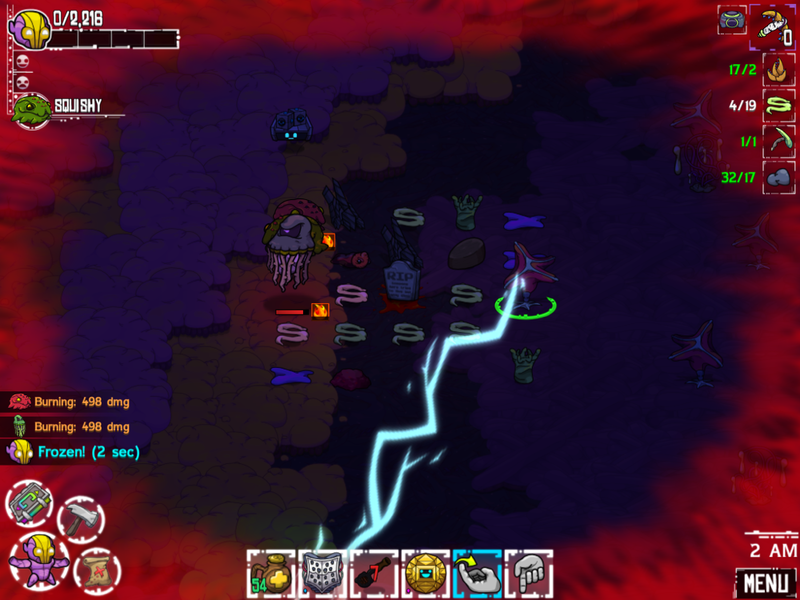 There’s a lot to like in Crashlands, but every so often I would stop and think, “why am I doing this?” If you’re looking for a huge game, this is probably a good bet for you. But for everyone else, let me break everything down to the good and the bad. First, a little about the story. Flux and her robot companion named Juicebox — who’s shaped like a juicebox — are interplanetary postmen. They’re delivering packages for the Bureau of Shipping, when a floating head named Hewgodooko blows up their ship so he can take the electrodongle from it. Your first task is to find the escape pod so you can get safely off the ship to Woanope. Your goal after that is to survive on this strange planet long enough to retrieve your lost packages and deliver them in time. The Bureau of Shipping doesn’t care much about your well-being, but they do insist on their packages being delivered in a timely manner. While you’re worrying about those packages, you’ll take on quests, which vary from menial furniture-building tasks to acts of heroism such as defeating bosses. One of the main things the game has going for it is its lighthearted tone and slapstick sense of humor — you literally slap characters to talk to them. You see it at the very beginning when Juicebox confirms for Hewgo that blowing up the ship will indeed allow him to get the part he needs. The humor is silly and loaded with puns, and it works well for the most part. I admit, I didn’t read through every bit of dialogue in the game, because there’s a hell of a lot of it and I was often impatient. But when I slowed down and took the time to read it, there were some great lines. I still think it could have benefitted from some editing, as not all of it is golden. And I wish the game would have kept the whole dialogue recorded in my log so I could read over it as I desired. Your time in the game will be spent questing, harvesting, crafting and battling. Things can be a little confusing at first, but I made this guide to help make sense of things when you first start out. Woanope is full of strange fauna and flora, and they all provide something that can be used for your crafting. You start off with a small workstation that can turn the first plants you find into a new workstation and a makeshift saw. The right tool is automatically used when you tap on a plant or mineral. Each workstation and tool you craft will allow you to craft yet another workstation, new armor, trinkets, gadgets, potions, elixirs and more. 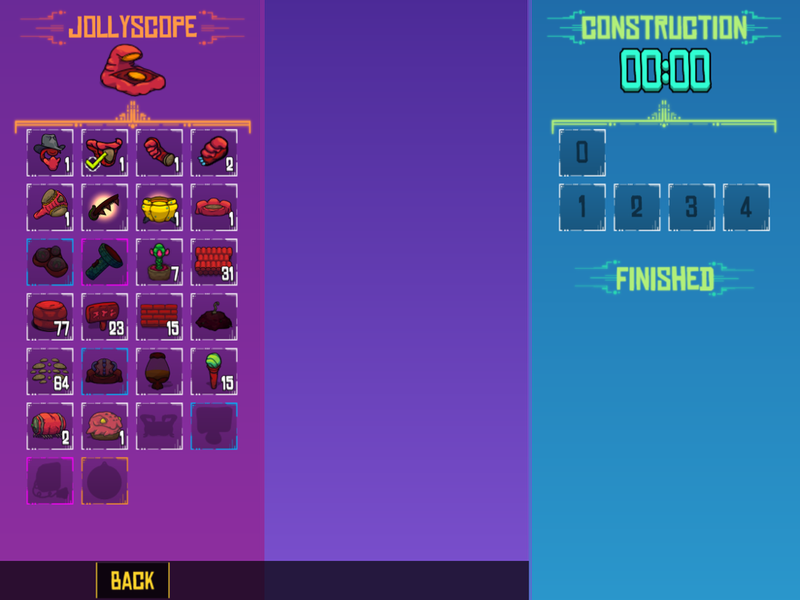 By the end of the game, you’ll have over twenty workstations, each with their own recipes, or schematics. This offers both a sense of progression, while at the same time feeling like a waste of time if you think about it too much. I chose to ignore the little voice in my head telling me I was wasting hours on crafting just to get a little stronger and a little further in the game. 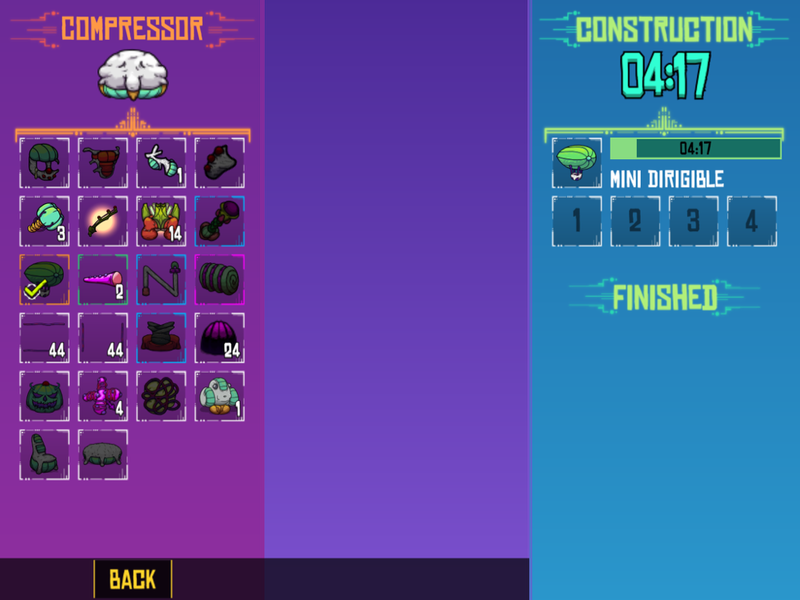 Crashlands has that “just one more quest” or “just one more recipe” hook to it, so once it sank its claws into me, I couldn’t stop playing, always wanting to craft one more item. Another aspect of the game that sucked me in is the pet collecting. I practically turned the game into a version of Pokemon, as I spent hours trying to loot eggs that can be hatched into different creatures. Each type of creature on the planet can drop an egg that you can hatch into a domesticated version of that creature. You can then name it and have it follow you around, fighting your enemies alongside you. Each pet also creates some resource that can be used in crafting, so the game actually encourages you to collect every pet. Whether you then spend the time to upgrade each pet to its second and third tiers is up to you. Doing so requires finding the schematic for it and then killing a number of tier 2 or tier 3 creatures to collect their essences for the recipe. Getting each pet to the third tier — epic — can be very time-consuming, but also very rewarding. I’m honestly not even sure the game would have held my attention to the end without the pets. They’re incredibly useful in battle and gave me something to focus on besides the quests. 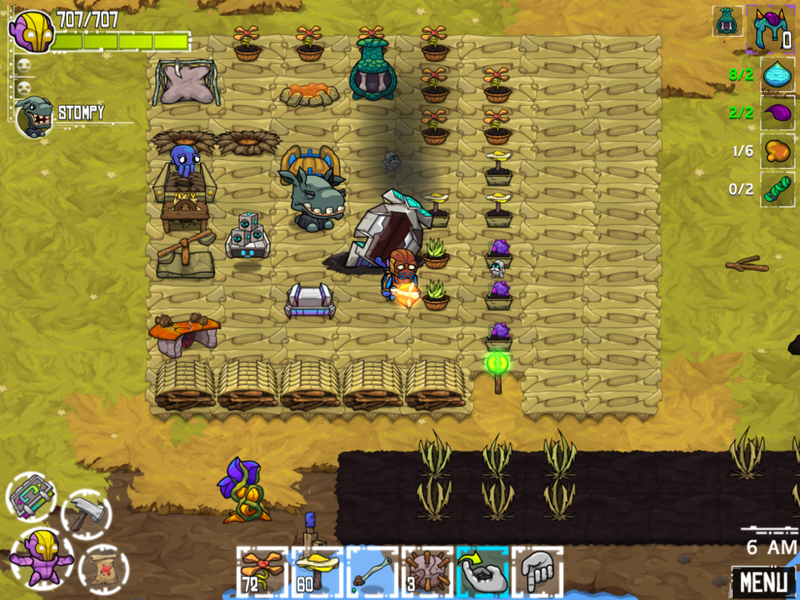 Everything you harvest from plants, minerals and creatures automatically goes into your inventory. You don’t have to manually pick them up and there’s no cap on your inventory, which goes everywhere with you. So you never have to worry about whether you can hold another Jackagong or Spood Beast. If you want to chop something down or kill it and you have the ability, do so. I do wish there was a way to see the entire inventory, though. The only way you can see how much of a resource you have is to collect another one or go back to your home base and find a recipe that includes that item. You also can’t see all your recipes on the go. You can only track one at a time. If you’re harvesting resources for more than one schematic at a time, you need to memorize the others. As you play, you’ll come across schematics that allow you to build furniture for your home base. You can decorate it with walls, chairs, lamps, even bubble shooters. You can also plant seeds that you find so you can grow a little home garden. That way you can have some plants close to home instead of having to go out and search for them every time you need them. They do take some time to grow, but it makes sense. The game can’t give you unlimited resources right at your home. I should discuss battle a bit, since that’s a huge part of the game. Everywhere you go, you’ll encounter wildlife. Some attack you if you walk by, while others will ignore you unless you attack them or cut down some plant that they’re fond of. 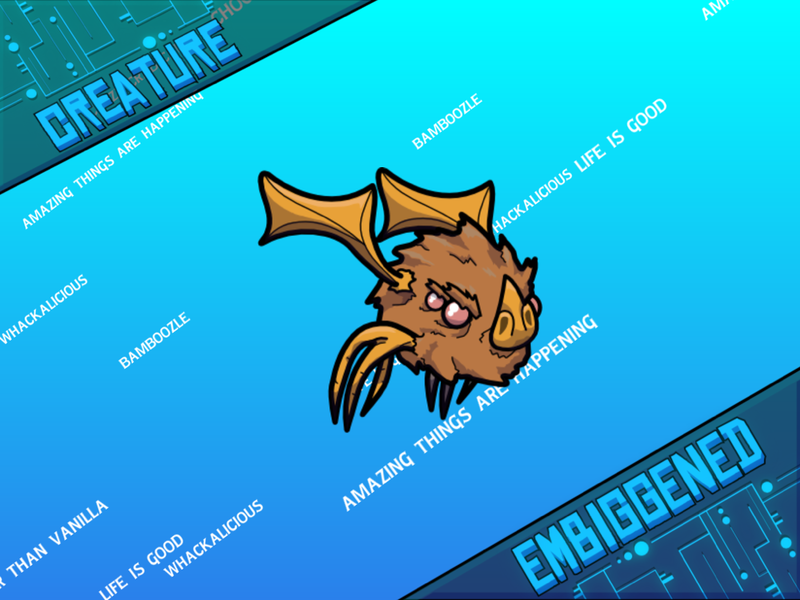 For instance, the second map you visit is the Bawg, and it’s one big living organism. Something you can harvest there is called a Nurva, and they act as the dendrites of neurons of the Bawg. If you chop one down, any Wojack nearby will get upset and attack you. So you can’t just harvest everything without taking your surroundings into consideration. Once a creature starts attacking, you’ll see its trajectory as a red area on the ground. This gives you time to get out of the way before it attacks that area. Your primary weapons in the game are melee, so you’ll have to get in close and learn to dance around their attacks if you want to do the most damage. 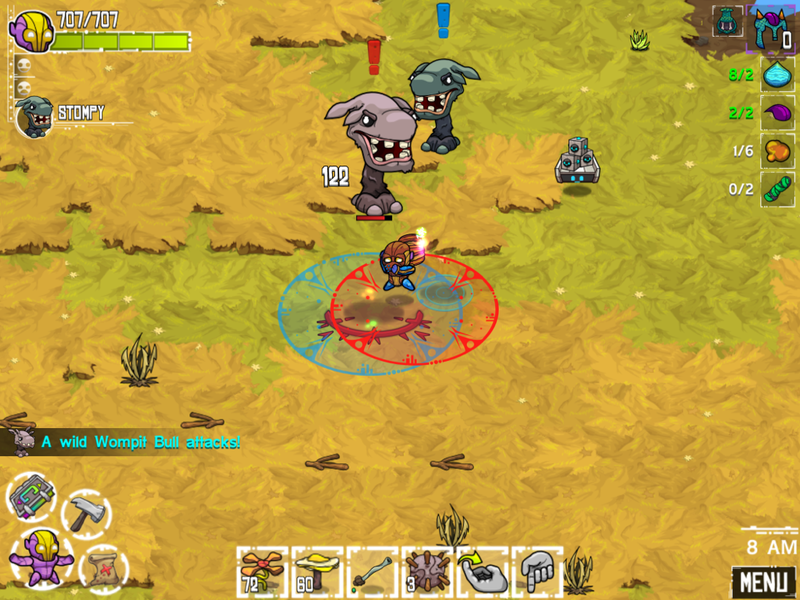 But the game offers enough trinkets and gadgets to provide many different play styles. For instance, I liked using my pet Vomma to deal most of the damage. But he would only attack for a few turns after I attack the enemy. So if I don’t continue attacking every so often, he won’t attack either. Therefore, I’d use a long-range tool like a flamethrower or snowball shooter to attack from a safe distance. Then I’d circle around the enemy until I needed to attack again. I also had a DBOT, which makes me invincible for a few seconds. I’d use that to get a few quick slashes in without having to worry about my own safety. Tools like the flamethrower and DBOT have cool-down timers, so they can’t be spammed; you have to use them sparingly and wisely. I also used trinkets that give my pets permanent boosts so they’d do more damage. Those who prefer to put less demand on their pets might find other trinkets and gadgets more useful. There are so many to choose from, that everyone will have their own favorites. I’m not a fan of spending time on something and then watching it all disappear over one small mistake. So games with permadeath, or deep repercussions for dying, don’t usually hold my attention to the end. But with Crashlands, death is merely a small inconvenience. You get teleported back to your home base while some of your stuff is left behind where you died. The best thing about it is that there’s a little gravestone marked on the map so you can find the spot again and reclaim all your lost items. Sure, you’ll also likely have to guzzle a few healing potions. But other than that, it’s no big deal. Your deaths are recorded in your stats, though, so if that’s something you care about then you’ll want to be more careful. For those with multiple iOS devices and a PC, the game features cross-compatibility between PC and iOS using the Butterscotch Shenanigans cloud saves. I haven’t played on PC, but the game has been nearly flawless between my iPad and iPhone. There was one time I lost maybe 20 minutes of crafting, but other than that I’ve never encountered any issues. While I much prefer playing on the bigger screen on my iPad, it was nice to be able to jump on my iPhone when I was out and about (or in bed) and get a few things done. I’ve even fought some boss battles on my iPhone, so it is perfectly doable on there. But if you have an iPad, I recommend taking advantage of it, as it will be a much better experience. Whichever device you decide to use, you can also adjust how much of the area is shown on the screen. So you can zoom out more if you want to see more of your surroundings on your iPhone. A lot of things are done to avoid all the time-wasting aspects you’d normally see in a crafting game. 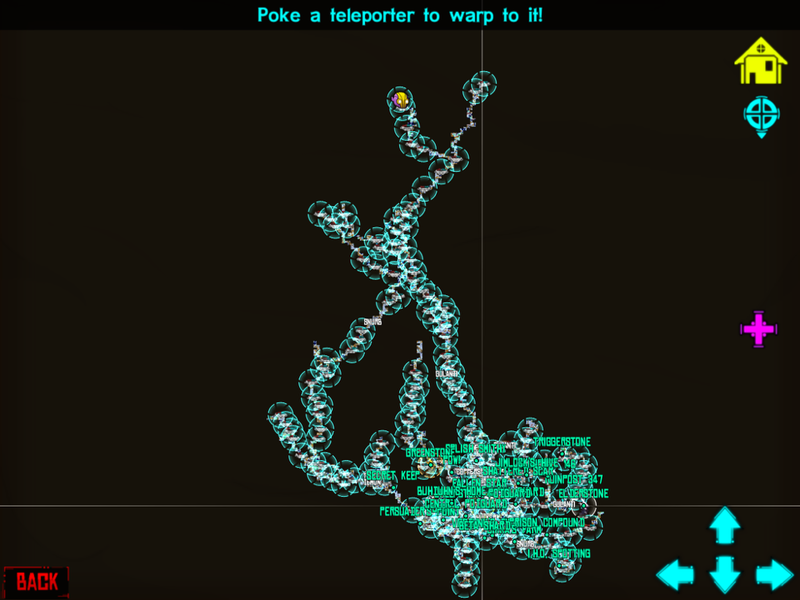 The unlimited inventory and numerous teleportation spots are just some examples. But considering how much time I spent in the game — over sixty hours — I think they could have done even more in that regard. The quests are one thing that wasted a lot of my time. The game is long enough and big enough that a clearer quest log would have been welcome, one that tells me where the quest giver is located when I need to return to them. 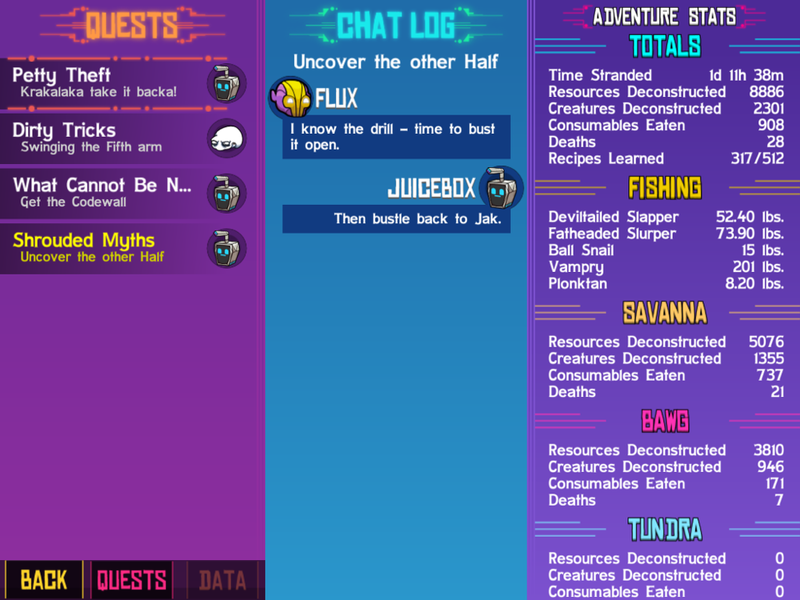 The quest log only saves your current tasks and dialogue. So if you don’t remember details, it’s very easy to forget where the quest giver is. Even though most locations are marked on the map, there’s nothing to tell you where a certain character is. Sure, you can place signs on the map, but that’s also time-consuming. And some characters move, so you’d have to follow them with your sign. I just felt like I was being punished for not being able to tell one alien from the next or not remembering what a quest wanted from me when I stopped in the middle of it. I was stuck on a quest in the second world for a long time because I couldn’t remember what or where the goal was and the log said so little. Still, I can forgive all that because it might just be an oversight that they’ll work on in the future. There are worse time-wasters than that in the game. What I can’t really forgive is the timers on crafting. I’m afraid to even think how much the seconds and minutes I spent waiting for my workstations to do their thing would add up to. I have absolutely no idea why the developers felt the need to include these timers. I see no benefit to them. If I spent the time hunting down the creatures that drop the ingredients needed for a certain schematic, just let me make and have the darned thing. Even if it’s a legendary item — I put in the time already to get the ingredients. Why make me wait another arbitrary five minutes for the workstation to make it? Even recipes that only take a few seconds — those seconds add up. Sure, you can go off and do other things while waiting for the item to finish cooking, but you’re still just trying to pass the time until you can have the stuff you worked so hard to make. I can’t help but feel that a lot of the time I spent in the game was simply wasted out of some idea that that’s just how games are supposed to work. 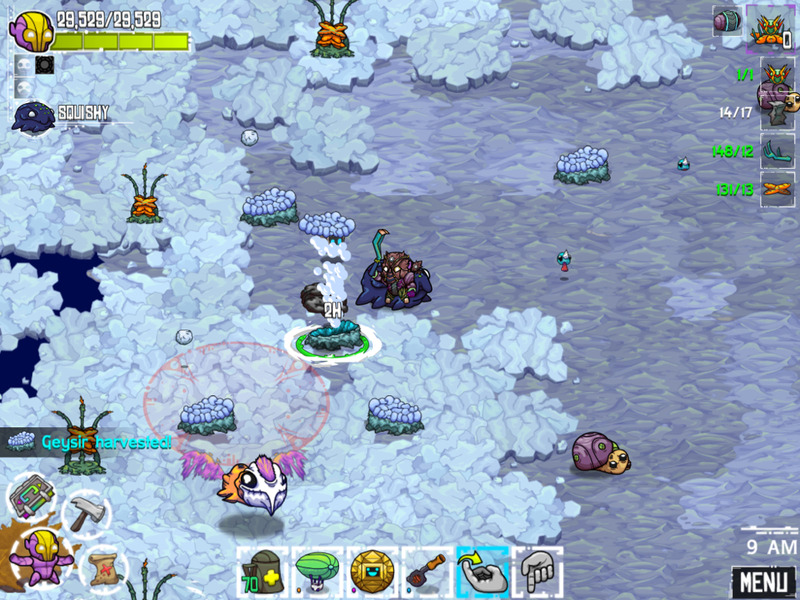 But the game already takes up so much of my time gathering resources, fighting monsters, etc. Why can’t I just instantly craft once I have the ingredients? And why can’t there be one button to prune my whole garden back at home so I don’t have to waste a few minutes to cut each plant down one by one? I don’t see how that improved the user experience in any way. Another thing that bothered me is when a schematic would call for an obscene number of resources. For example, the schematic to upgrade my Bamli to tier 2 required twenty-two Powerful Bamli essences. This meant killing twenty-two tier 2 Bamlis, as they have a hundred percent drop rate for the essences. But the recipe also called for sixty-five Bamstaches, which have a much lower drop rate. So I had to waste my time killing lots of weaker Bamli just to get those ingredients. It wasn’t a challenge. It was just busy work. 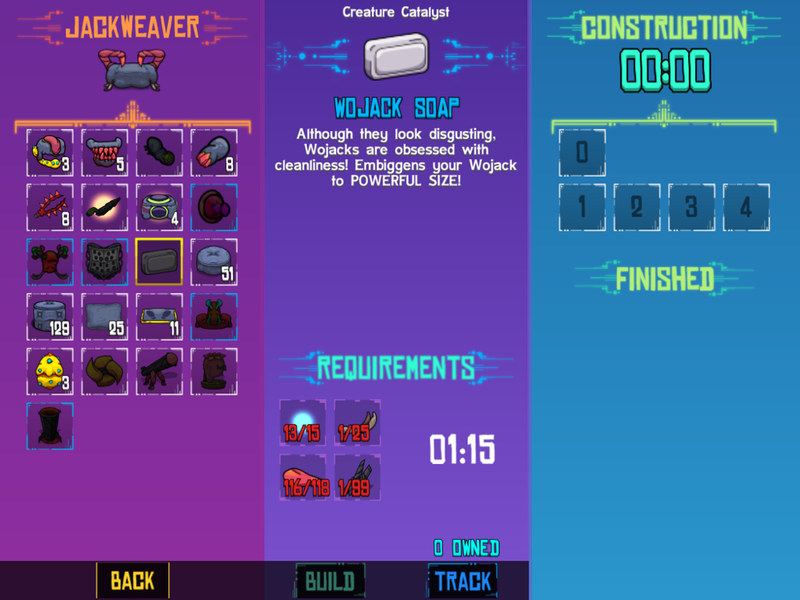 Even worse, the Wojack Soap that upgrades the Wojack to tier 2, requires ninety-nine of a specific plant. Each plant gives exactly one piece when you harvest it. At least the first time I made one to use on my pet, I was still in the Bawg and still weak enough for the creatures around me to offer a challenge. I also had plenty of other resources to gather. So I collected those ninety-nine Splinters while I did other things. But late game, when I had already moved on to the third and final map, a quest asked for another Wojack Soap. Going back to the Bawg to collect the Splinters at this point offered zero challenge and did little for me besides give me some mild carpal tunnel. I’m not really sure how the developers thought that was a fun quest. Additionally, there are some resources that are incredibly rare. There’s this orange goo late game called Liquideon that is needed for several late-game recipes. I searched high and low for these. I figured out which terrain they were found on and searched those areas carefully. But I walked around so much and found so few, despite knowing exactly what and where to look. Why did it need to be so rare? Again, this is already a long game. Why waste my time like that? Look how big my map got just looking for that ingredient — this is zoomed all the way out. There’s even one pet I haven’t upgraded to epic status because I could only find one of them in the wild, no matter how far I looked. Another thing that bothered me is that the map is not geared towards touch controls like the rest of the game. You have to use arrow buttons to move the map and plus and minus signs to zoom in and out. It’s clunky, but I got used to it after some time. It’s not ideal, but it’s not the worst thing in the world. 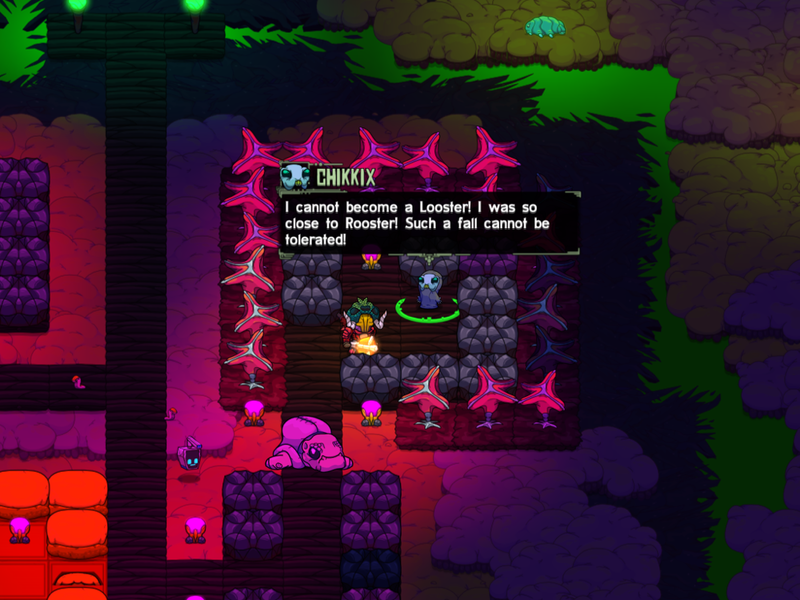 Despite these complaints, there is a lot to love about Crashlands. It does so much right. The battles are fun, each boss is very different, and the pets add a whole other dimension to it. Even though the world is huge and there are three different maps, they each add enough variety to make it worth playing through the whole thing. The Bawg introduces plants that explode when you feed them grubs, while the Tundra has plants that can harm you if you’re not careful where you step. There’s also a night and day cycle that you can control simply by pulling out a bed and taking a nap. There are some plants and creatures that only come out at night, making it more deadly but also necessary to explore. Lots of things also glow in the dark, making the nighttime especially beautiful to explore. There are also Guysirs that are so incredibly satisfying to pop. And, of course, looting schematics and rare ingredients is exciting, because it’s a crafting and bartering system. You don’t just earn gold to purchase things. And you most definitely can’t use real cash to buy your way ahead. So progress feels like a real accomplishment. I also want to mention the great original soundtrack, as I can’t think of many games that I continued to listen to after so many hours playing. It’s very rare for me not to mute a game’s music after a couple of hours. 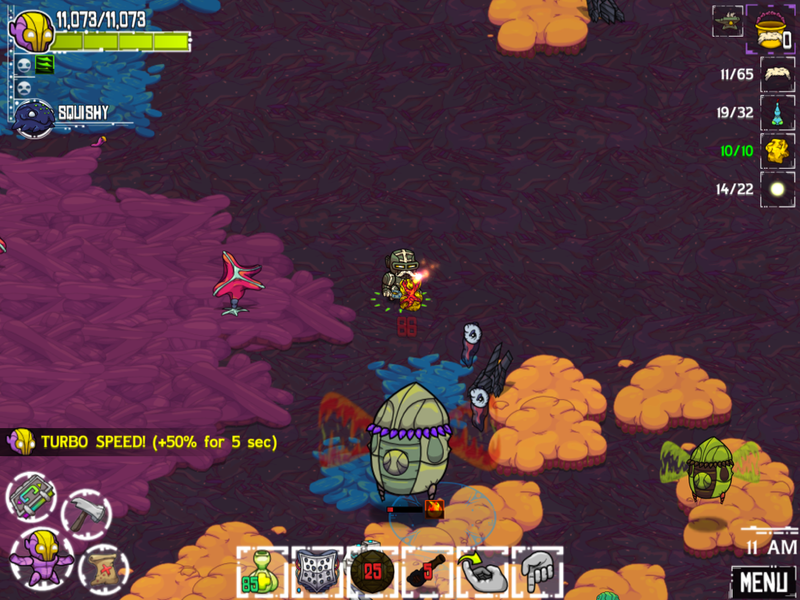 But Crashlands‘ music is relaxing and varied enough to keep it interesting even after sixty hours. 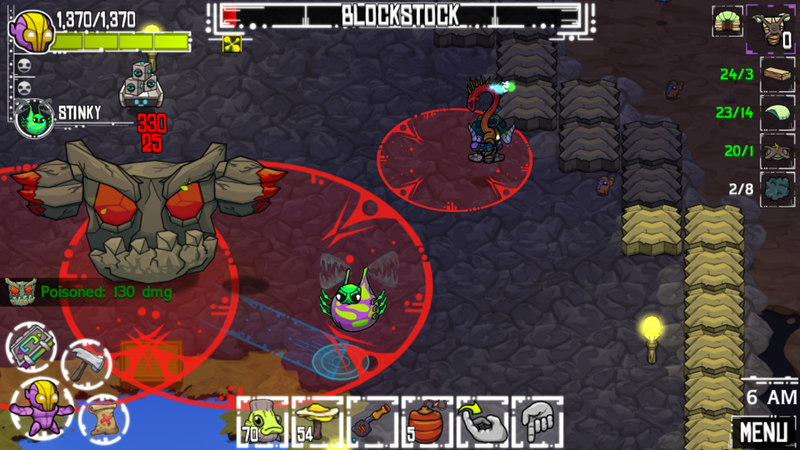 The bottom line is, if you have the time and patience for it, Crashlands is a great game. But if you’re not looking for something that will consume hours and hours of your life, much of it on tedious harvesting or figuring out what a quest wants from you, then it might not be the game for you. I enjoyed my time with it quite a bit, but at the same time, I kind of regret spending over 60 hours in the game — especially when some of that was just waiting for recipes to cook up or searching for a rare item. There are also a few minor bugs, but I think that’s to be expected in a game of this scope. It’s obviously a work of love, with puns aplenty and so much attention to detail. You just need to have the time for it. If it sounds like something you’d enjoy, you can download the game here. You can also see these gameplay videos I made of the very beginning of the game an a later one showing off my Epic Vomma. If you’re already playing and need help, try my Crashlands walkthrough guide. Next PostTwofold, Inc. Review: Do You Feel Lucky, Punk? Going to try and play the game without your guide. But nice to know it’s available. Thanks, see you around TA.